Place half of the strawberries into a blender and pulse several times to blend. Pour sauce into a bowl. Slice or chop the remaining strawberries and add to the sauce. Mix and set aside while the mousse is prepared. Place the soymilk, cocoa powder, maple syrup, agar and sea salt in a medium saucepan. Bring almost to a boil, stirring constantly. Reduce heat to medium-low and simmer for about 5 to 6 minutes until the agar has dissolved. Pour into a blender and pulse several times to cool and dissolve any remaining agar and chocolate. Place back in the pan and allow to cool. Place the aquafaba in a mixing bowl and blend with a hand blender for 6 to 7 minutes until the consistency of whipped cream. Pour the cooled soymilk into the aquafaba and gently mix by hand until thoroughly blended. 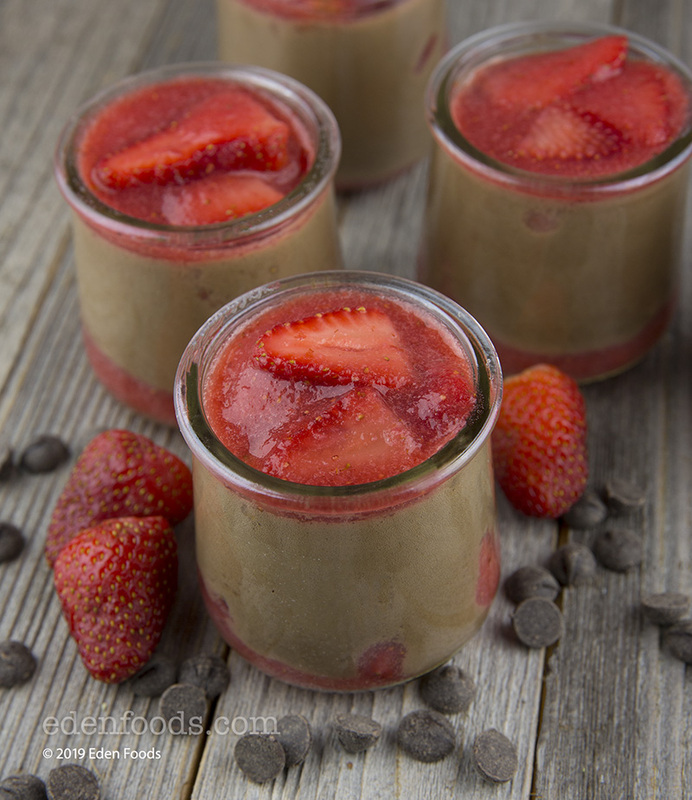 Place a couple tablespoons of strawberry sauce into 4 dessert cups. Pour an equal amount of soy/aquafaba over each. Refrigerate for a least 1 hour until set. Remove pour the remaining strawberry sauce over each and refrigerate for another 1/2 hour before serving.